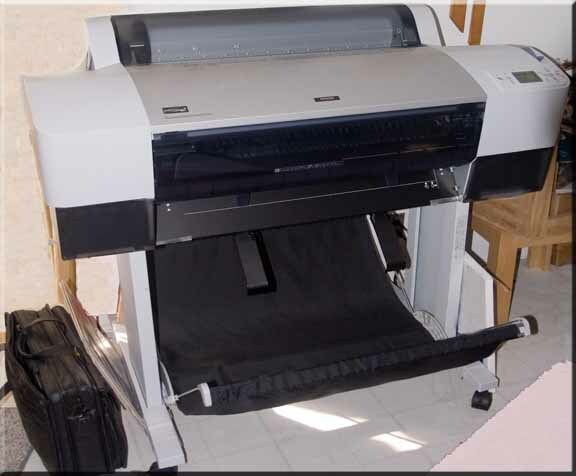 A printer used for Giclee Fine Art prints is a very different beast from a desktop inkjet printer, no matter how high quality it may be. 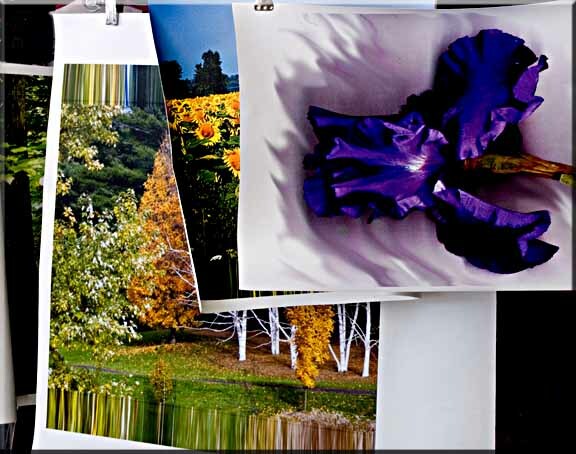 Giclee printers use a different technology of inks and more color cartridges to obtain a wider gamut of color and sharper definition of detail. They produce archival prints on artist canvas or fine art papers. Being an artist/printer assures me of complete aesthetic control over my artwork with no film developer or print service to mediate between my vision and the final artwork. When I have commissions for prints larger than my printer can handle, I have the giclee fine art print executed by an artist/printer who works closely with me to assure that the results are exacly as I envisioned. The Giclee prints are produced on specially treated canvas or on a variety of fine art papers. Each of the different media influences the final image and so the artist is involved in numerous experiments to decide which media brings out the specific qualities desired. I have been involved with experimental comparisons with other artist/printers to help determine my choices. The frame for each Giclee print is determined by the qualities of the print itself. Some are matted and framed like traditional photographs except that the chosen mat must be water resistant because the canvas Giclee prints are not covered with glass. This is one of the great appeals of the Giclee canvases. There need be no barrier between the image and the viewer. Other Giclee canvases are stretched over a frame like traditional paintings. The one difference is that the canvas that covers the edges of the frame is printed - either with an extension of the image, or a decorative border. For this reason, the canvas doesn't need any further framing and can be hung as is. A third method of framing is an innovation I have developed. In effect, I construct a curved canvas stretcher and mount the canvas on it, then add a unique top and bottom frame to complete the piece. 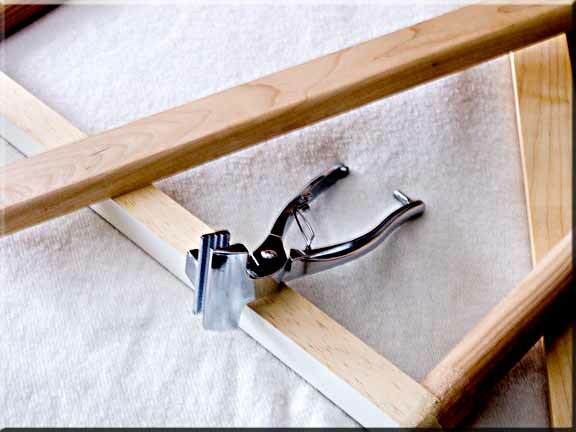 Other giclee canvases are stretched over a frame much like a traditional painting. 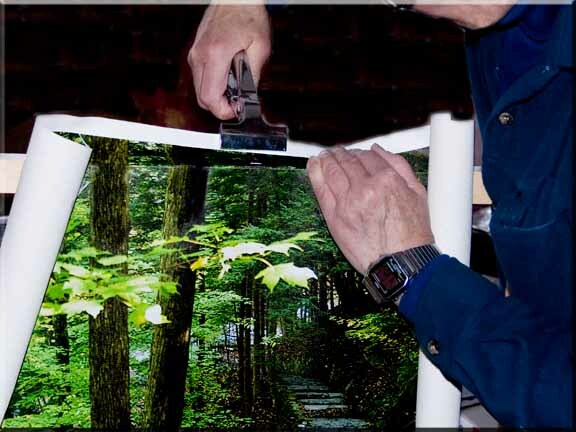 The one difference is that the canvas that covers the edges of the frame is printed - either with an extension of the image, or a decorative border. For this reason, the canvas doesn't need any further framing and can be hung as is. To see an example of what I mean, click here. A third method of framing is an innovation I have developed. 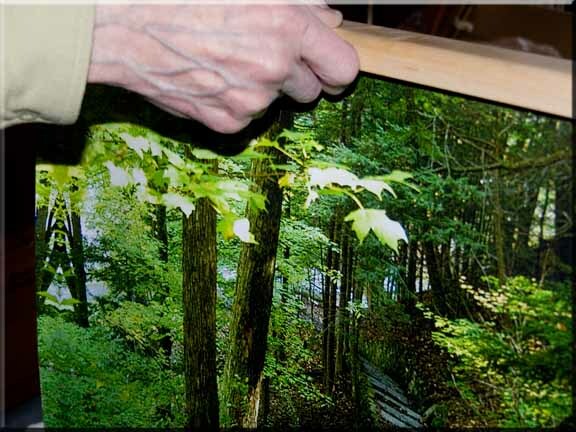 In effect, I construct a curved canvas stretcher and mount the canvas on it, then add a unique top and bottom frame to complete the piece. I choose this more complex method for those pieces where the shape of the frame emphasizes the three-dimensional quality inherent in the image. To see an example of this type of framing, click here. The term Giclee covers images printed on many different media. My photographs are printed on fine art paper, artist's canvas, or archival photographic paper using the newest pigment-based ink technology. These Giclee prints exhibit an exceptional spectrum and depth of color that has not been available until recently. As well as brilliance of color, the purchaser will receive a work of art that will last for generations. The Giclee prints on canvas receive free additional UV-blocking coatings and can be hung without glass protection giving a more intimate view of the art print.